Despite the historical reluctance of courts to hold a director or active shareholder liable for actions that are legally the responsibility of the corporation, corporate "veil-piercing" continues to be a highly-litigated issue in corporate law. Quite often such cases arise when a corporation facing legal liability transfers its assets and business to another corporation with the same management and shareholders. In short, the corporate form loses its substance, but instead becomes a vehicle by which to skirt responsibility. While no bright-line test exists for the court in deciding such whether or not the corporate structure has been abused, courts often analyze accounting issues in deciding these cases. This can make the use of an expert witness highly desirable and possibly necessary. 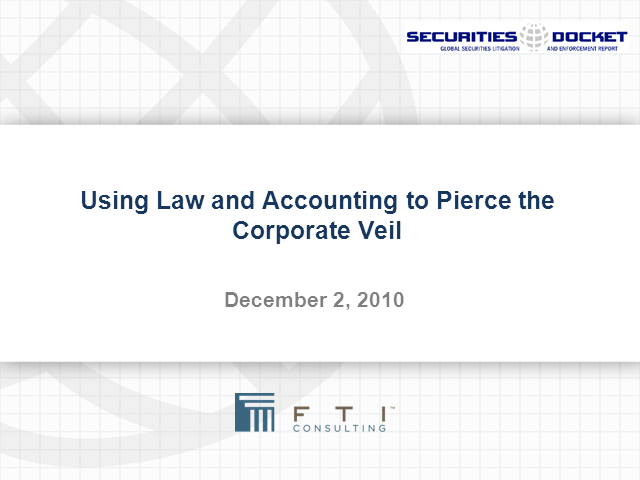 Please join James Hardgrove, partner at Sidley Austin, and Jeff Litvak of FTI’s Forensic and Litigation Consulting practice as they discuss a matter in which they collaborated to help a client successfully pierce the corporate veil. The panel will discuss the roles and interconnection of law and accounting in "alter ego" cases, and will describe the framework of the expert report that that was used to successfully pierce the corporate veil in court.